Welcome to my floral art blog. A place to share my passion for art combined with flowers of every shape and size. Another pansy painting straight off the easel. 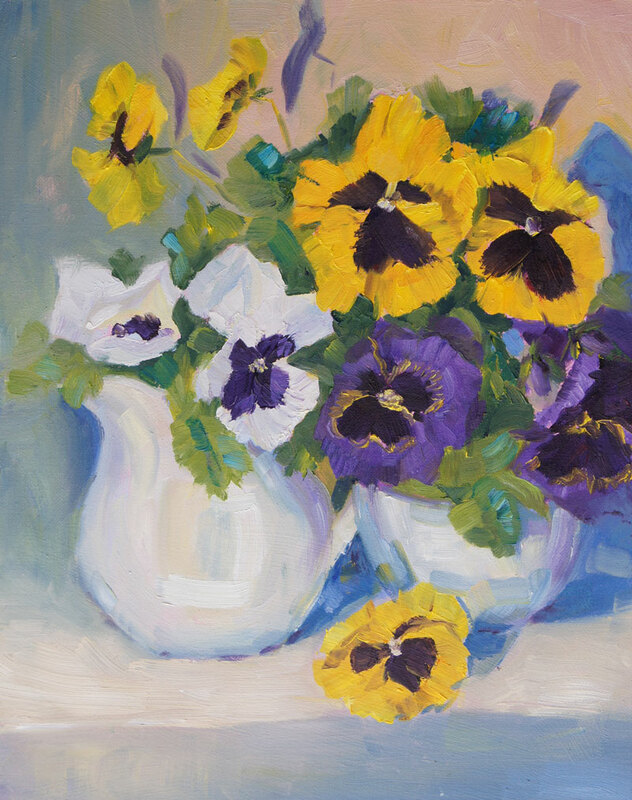 I love painting these pansies, and those yellow ones really talk to me. This is slightly larger than my earlier pansy painting (see HERE) and more of a still life composition. I painted it wet in wet, trying to stay loose. I succeeded in parts, but I still find myself trying to put in all the details. This is still wet and I will look at it tomorrow to see what needs tweaking. Those blue shadows are too blue in this photo, so I will also see if I can get a better photo. I always have trouble with photographing blues. I love this painting, bright and colorful ! Give a gift of an original artwork or gift certificate to family and friends. I will gladly gift wrap a painting and send it directly to the recipient with a gift tag. Welcome to my floral art blog. In this blog I will showcase my flower paintings and include some work in progress to show you my techniques. Most of my floral paintings are inspired by flowers from my garden. I paint in many different media as I love the challenge and change that each media brings. Although I also paint landscapes and still life, I always return to painting flowers. If you have any questions about my paintings, please contact me via email.